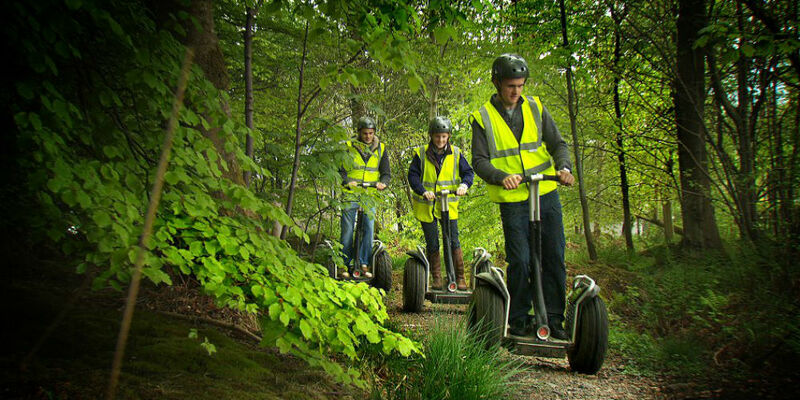 Segways are easily our most popular activity. It’s easy to see why – it’s physically impossible to hide your beaming grin as you hurtle around the off-road track for around an hour. No wonder we’ve got Scotland’s biggest fleet. The clever technology of your two-wheeled electric steed keeps you tootling along at a fare old pace. It also keeps your Segway remarkably stable, even up and down the steepest paths and bumpy terrain of the off-road course. You almost won’t believe it’s so easy to master. Frankly, once you’ve mastered a Segway you’ll never want to get off it – though it doesn’t work so well at a finger buffet. Action Glen is Scotland’s newest outdoor adventure centre. Then there’s our very own 900 acre estate – complete with 18 hole golf course, offroad sand and gravel quarry and treetop ropes course.